The State of the Coasts of Batangas Province was developed to assess the progress and impacts of ICM implementation in the Province. 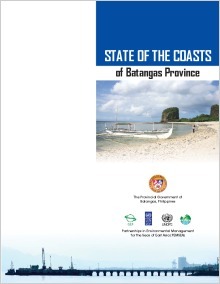 The report serves as the first comprehensive assessment of the Province's progress in terms of the SDCA framework, and in relation to its implementation of the Batangas Province Strategic Environmental Management Plan (2005-2020). This report was prepared through the concerted efforts of stakeholders, namely: national, provincial and municipal government agencies; nongovernment entities; the private sector; universities; and community groups. The contents of this report were validated through site visits to 10 coastal municipalities for field verification of information, and through interviews with government and nongovernment stakeholders throughout the Province. The results were reviewed and concurred by stakeholders during the final SOC workshop, which was conducted on 24 June 2008 in Batangas City, Philippines. In general, the Batangas SOC report noted positive developments in the province particularly in various governance aspects. The approach taken by the SOC and the focus on the local level provides important information on what is happening on the ground which is often not readily available. By building on strong data and monitoring system at the local level, the local SOC reports can eventually be rolled up into reliable national and regional SOC.